Having some computer issues no pic posted yet but working on it. SUPPORT THE REPORT: It was a great Winter Season thanks for all your support. Hope to see you for open water and great Summer fishing vibes. 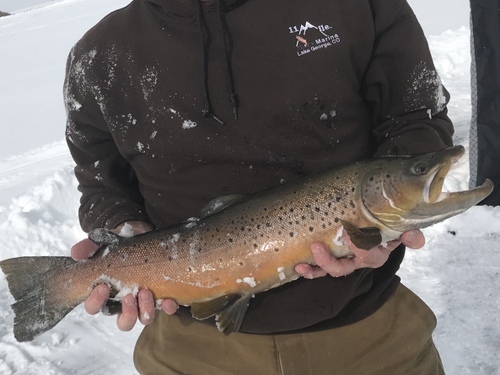 FISHING REPORT PHOTO CONTEST: The Winter contest was great and we are thinking of moving it to a seasonal thing. Stay tuned save those pics. CONDITIONS:: Park is open 24/7/365. A lot of ice has gone this week. Looks to be about 60% ice covered. There are shore fishing opportunities all around the lake. SPINNEY MOUNTAIN: NO OPENING DATE SET AS OF THIS REPORT. WATER FLOW: IN 85.8 CFS OUT: 93.4 CFS That’s a lot of water coming in for this time of year. Should help open things. SPINNEY:Aurora Homestake at 75CFS .that should also help. TROUT:VERY GOOD: Initial reports are good with a lot of action for fish in many categories. Fly, lure or bait seems to work at some point through out the day. Suckers Cove, North Shore and Howbert have seen great action. Pink Power Bait, Nightcrawlers and Salmon Eggs for bait, Kastmaster, Rapala and Thomas Bouyant on the hardware and look to Black and Green Wooly Buggers on the Fly. Not to mention all kinds of other stuff. Time to hit the shore line at the Mile. CONDITIONS:: Park is open 24/7/365. Lake is 96.9% ice capped. Ice thickness running 5 to 17 inches. The ice is soft and candling. The edges are going in many spots but you can still get on the ice particularly on the East end of the lake if you want. Based on today’s observation there will be ice fishing opportunities this weekend. It was 15 degrees this morning. Extreme caution advised. Fresh snow helps identify weak spots. There are limited shore fishing opportunities. The most are at North shore with the little boat ramp cove as we call it open just enough and the shoreline all along the marina area is open. for a moderate cast and expanding. Ice conditions change rapidly and ice can shift. This is when you want to fish for the real big ones. It’s shoreline trophy season now! It’s hard to imagine the lake open for boating before May 1. The latest we have seen it was May 10. SPINNEY MOUNTAIN: NO OPENING DATE SET AS OF THIS REPORT. 95% ice covered. WATER FLOW: IN 142 CFS OUT: 77.3 CFS That’s a lot of water coming in for this time of year. Should help open things. SPINNEY:Aurora Homestake at 75CFS .that should also help. NORTHERN PIKE:NO REPORT. Get out your Chartruese Power Bait. SUPPORT THE REPORT: It was a great Winter Season thanks for all your support. Couple more weeks to go! THIS WEEKS WINNER(S): Josh Isyne, father Tom and Mike E. strike it Kokanne rich with gold. Pic Mike Essam. And Drew gets this whopper of a four year old which are far a few between. The bite is getting even better if its possible. CONDITIONS:: Park is open 24/7/365. No open water. Ice thickness running 12 to 21 inches. Ice close to shore is thinner and softer with thicker and harder ice in deeper water. Always be careful around rocks. Caution always advised in Spring. Early on early off is a good policy. Water clarity poor on points West. Melting snow into lake creates clarity issues. No problems seen for this weekend and probably next weekend. 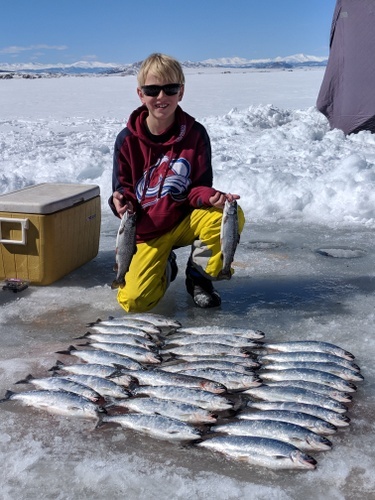 It's been a while since we had a full March of hard water fishing. Bring the grill for the on ice Springtime barbecue. TROUT:VERY GOOD: Action is consistent all over the lake. Cross Creek to Suckers Cove fishing very well but be very careful of ice conditions. Typically things get softer faster there. Stocker action strong at North Shore but you can see them almost anywhere now as the Winter stocking is rapped up. Large tube jigs, Trout Traps and Krystal Lazers hitting the best, always tipped with something. You can use meal worms, wax worms, salmon eggs, piece of night crawler, even small shrimp to entice on a jig but definitely use something. KOKANEE SALMON: EXCELLENT: Always amazed at how anglers create a crowd. Cross Creek sees it early in the Season like its the only place holding fish and now Coyote Ridge to Duck Island looks like the only game in town for salmon. Thing is, it's not. Big crowd out there last weekend. But you can do just as well out past Deer Island and the limit pic above was out from North Shore Marina. That's 3 limits and two small Trout. That looks like an awesome time. They caught them all on the same bait. Gold Swedish Pimple with orange tape. But that does not mean that's what they will hit tomorrow. The bite was late last week with things really turning on after 1:30PM. But like the baits the times can change. One thing is for sure the time on the ice will be drawing to a close soon so if you are inclined better get salmon fishing. Our guide trips have done very well of late, just a few dates left. And you never know you might get a real whopper like Drew in pic below. NORTHERN PIKE:FAIR: Sometimes you would think these fish middle name is Kokanee as finicky as they have been. They are there but very leery. We are sold out of waterdogs for the season. Suckers in stock. Smaller fish being caught but the trophies are elusive. They are visible but hard to catch. Not much change here.